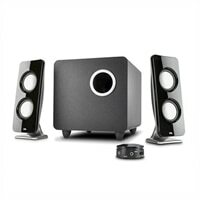 CA-3610 Curve - 62W Peak Power Speaker System with Control PodThe Immersion features excellent styling and optimized sound characteristics, at a price that truly astounds for any need. It’s built to compliment the home, and truly delivers immersive sound for computers, tablets, music players, and more. The Immersion features excellent styling and optimized sound characteristics, at a price that truly astounds for any need. It’s built to compliment the home, and truly delivers immersive sound for computers, tablets, music players, and more.